Catching fish on the fly will test your skills and abilities to the limit, but you have to know what to use for the fish you want to catch in great detail other wise you will waste a lot of time and energy catching nothing. Fish on the fly – What can you catch? At sometime or another you can catch any fish on the fly or an insect off the surface, as the picture on the right testifies to, this perch was taken on a fly. This is not the normal result you would expect when you cast the fly out. Here we will give you an insight into what you need to look out for on, in or around the water to help you catch your quarry. When t comes to fish on the fly the Trout is probably the fish most associated the fly fishing, be it on stocked water or in a naturally stocked river, some species of the Trout is fished all over the world. Although Trout will take flies of the surface, they do most of their eating below the surface. To this end wet flies are the most suited technique to use. The water conditions you are fishing will have an impact on the method of wet fly you employ. If you are fishing still water or water with a gentle flow you should just cast out and retrieve the line at varying pace. Work your casting it an arc fashion starting at 9 o’clock and working round to 3 o’clock. This will let you cover all the water. When you are retrieving the line you want to make the Trout believe that this is a real fly and take it. To do this you have to mimic the behaviour of the fly in the water. We do this by holding the rod up high and drawing the line back through the rod rings, forcing the fly to pull back through the water like the fly struggling to get to the surface. If the water is flowing you want to use the down and across method. This involves casting the fly down and across the water and letting it find its way down stream with the flow. The flow will take the fly down until the line is fully extended and then the line will pull across the flow into the bank. When the flow is fast you want to position yourself so that you can cast across the river at an angle of 45 degrees or move. This is because the fly is going to get pulled round in the flow a lot quicker and so you need to get it to where the fish are going to be. Even though the flow maybe fast the Trout is still cautious and will have a good look before taking the food. 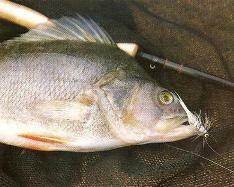 Pike fly fishing is a new development in the fly fishing world.